It was looking like this year might be the first exception but now late season Hurricane Noel looks destined to make some noise in eastern Long Island, Cape Cod and the Islands later Saturday. 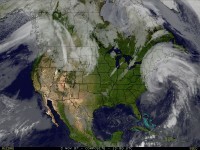 It was a CAT 1 Hurricane but quickly transformed from warm core to extratropical Friday. Despite this change, the storm will maintain its strength and hurricane force winds (at least in gusts) are likely in Nantucket and perhaps other spots as the storm races north-northeast and makes landfall by Saturday night on Nova Scotia. Had it made landfall just 4 days later, it would have become a rare Snowcane as cold air would have been in place in the northeast. As it is as it moves through eastern Canada the next few days it will draw in enough cold air to have snow in the backlash. By the way, despite all you hear about this winter being a warm one for much of the country because of La Nina, this particular combination of factors usually means a colder La Nina for the central and eastern United States with frequent snows across the northern tier and periods with frequent Alberta Clipper lows. Look for snow on the ground even in some of the big northern cities before Thanksgiving. For a larger image click here. For a real-time loop go here.